Green Life provide no information on their website about who owns or runs the business. The Green Life website domain (“thegreenlifecompany.com”) was registered on September 4th, 2017. “GREEN LIFE company” is listed as the domain owner. An address is missing although France is listed as the owner’s country of residence. The Green Life website is in French although there is also specific marketing toward Africa. Two examples are Green Life affiliate packs, named “RP1-Europe” and “RP1-Africa” respectively. Some African countries speak French as their national language. It’s a safe bet whoever is running Green Life is based out of France itself or one of these African countries. The use of euro as a form of payment within Green Life favors Europe over Africa. The corporate Dubai address provided on the Green Life website can be dismissed as a red herring. Recently Green Life appears to have been focusing on Vietnam, which eventually attracted the attention of the Vietnam Competition Authority. In August the VCA fined Green Life $22,600 for engaging in business activities outside of what it was authorized to conduct. There are also reports Green Life instructed students to take out mortgages, and then use that money to sign up as Green Life distributors. Consequently the Vietnam Competition Authority has revoked Green Life’s registration certificate. Read on for a full review of the Green Life MLM opportunity. The Green Life website features a number of personal care and nutritional supplement products. Specific product categories offered are face, hair and body. There’s also something called “Wincard”, which as far as I can tell is tied to some sort of gambling outfit. Retail pricing is provided, however none of these products appear to actually be purchasable. Instead they are only available to Green Life affiliates, who can acquire them by signing up with an affiliate pack. Green Life affiliates purchase packs and are paid to recruit others who do the same. Each pack either comes with an assortment of Green Life products or Wincards. When a newly recruited affiliate purchases a pack, the affiliate who recruited them earns a commission. Green Life pay residual commissions via a binary compensation structure. At the end of each day Green Life tallies up new CV on both sides of the binary team. Certain products are available with certain packs. Which pack is purchased also dictates how long a Green Life affiliate is commission qualified for. Green Life is your classic product-based pyramid scheme. The company does have products but they are only available to affiliates. There’s no retail activity built into the compensation plan, so what you wind up with is products serving as a means to an end. That end is paying a fee and getting paid to recruit others who do the same – the classic pyramid model. And even then, Green Life isn’t a particularly profitable pyramid model. For some reason the company limits daily binary commissions to just €7 EUR a day, and that’s at the €1000 EUR Gold Pack tier. Most of the money seems to be upfront, with residuals paying peanuts. A bit of a moot point considering pyramid schemes are illegal the world over but still worth pointing out. 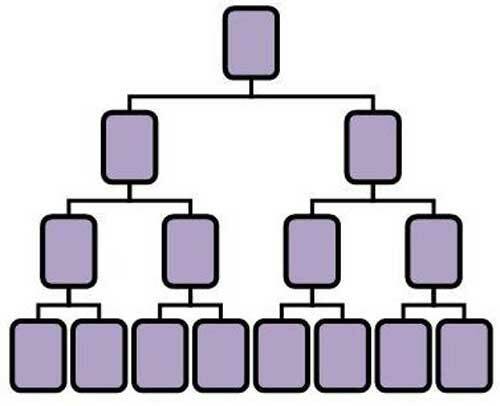 As with all pyramid schemes, commissions are tied to affiliate recruitment. Once recruitment inevitably slows down Green Life will collapse, resulting in the majority of affiliates losing money.